Do you possess self-motivation, good time management skills, and a desire to succeed? There’s a good chance you’re cut out for a career in numerous business fields if you get the right skills! You just need to develop your knowledge of accounting, marketing, and office management. With your initiative and our support, we thrive. Our Occupational Associate Degree program in Professional Business Systems prepares you for a career in business, whether that be working for a corporation, startup, or following your own entrepreneurial ambitions. The Professional Business Systems program gives students the opportunity to build a strong foundation for understanding business operations while also enhancing their skills in communication, digital presentations and business software. Is a Career in Business Right for You? Find Out! 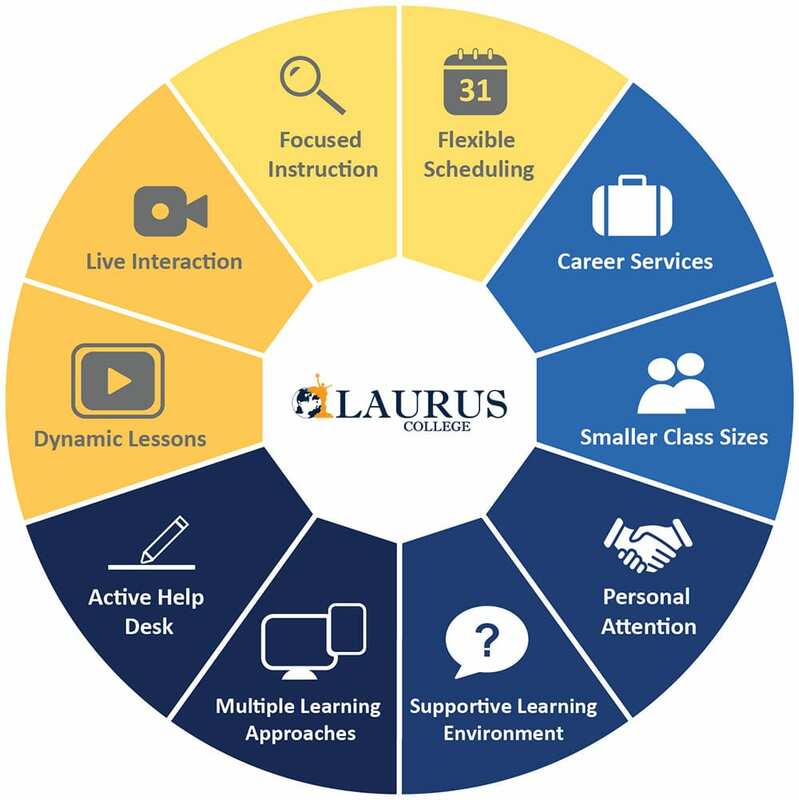 Take the "Laurus College Business Career Training Readiness Quiz"
Business Systems professionals plan, direct, or coordinate one or more administrative services of an organization, such as records and information management, human resources, accounting, marketing, facilities planning and maintenance, purchasing and event planning. With so many professional opportunities available to people with the right qualifications, Laurus can prepare you for a career that will take you to that next level in life. Locate and notify customers of delinquent accounts by mail, telephone, or personal visit to solicit payment. Duties include receiving payment and posting amount to customer’s account; preparing statements to credit department if customer fails to respond; initiating repossession proceedings or service disconnection; and keeping records of collection and status of accounts. Compile and record employee time and payroll data. May compute employees’ time worked, production, and commission. May compute and post wages and deductions, or prepare paychecks. If you’re juggling work and a family, you’re busy. Our hybrid learning model gives you greater freedom and flexibility to learn on your own schedule. That means you’re in control of your learning experience. All you have to do is make that crucial first move. And training with Laurus for a career in the business world, with all our dedicated support from Day 1 till you land that dream job, is always a smart choice. 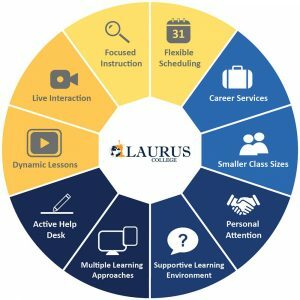 With a program led by experienced professionals from the field, Laurus helps motivated people get the skills and experience to pursue careers in the challenging business world. The best way to see if Laurus College is the right fit for you is to see it for yourself. You can tour our facilities by coming in to any of our campus locations, or we’re happy to set up a virtual tour with you. Book a Tour Now or Get more info. Practical, Career-Focused Training that prepares you for an in-demand career. Supportive Learning Environment where instructors care about your success. Flexible Scheduling Options that include both day and evening classes. Laptop Included – Students attending classes in an Occupational Associate or Bachelor’s Degree program are given the opportunity to receive a laptop computer loaded with all of the software needed to complete their program. Job Search Assistance through our Career Services Department, including resume & portfolio creation, interview preparation and live workshops. If you’d like to know more about the careers available to grads of our Professional Business Systems program and explore whether Laurus is right for you, fill out the form on this page to receive more information. * Program length when completed in normal time. In this course students gain an understanding of the word processing software Microsoft Word. Students in this course create numerous Microsoft Word documents, and apply various techniques such as editing and proofing, formatting text, cutting and pasting, saving and deleting. Students use tables, styles, and graphics to build documents such as business letters, letterhead, envelopes, and flyers. Students also learn how to perform a mail merge using Word’s powerful Mail Merge feature. This course gives students the foundation to work effectively with this software and to market their acquired skills to potential employers. This course covers the fundamentals of financial accounting, including double-entry accounting and the accounting cycle. Other topics include cash, receivables, inventories, plant assets, liabilities, partnerships, corporation, investments, statement of cash flows, and interpretation of financial statements. This course covers basic Microsoft Excel skills that include creating, modifying, and formatting a worksheet, and turning the data into highly functional charts. Students begin to experiment with basic functions and formulas and learn to automate spreadsheet tasks. Students build and edit worksheets, work with cells and cell ranges, format cell contents and values, and manage workbooks. Students in this course are exposed to basic issues in starting a business. Topics may include capitalization, staffing, subcontracting, permits, facilities, and basic business planning. The course offers students practical exercises to begin strategic development of a business and offers practical problems and issues in the startup phase of building a successful organization. Students in this course gain an understanding for creating electronic presentations using Microsoft PowerPoint. Topics in this course may include working with template slides, formatting slides, working with layouts, working with graphics, creating charts, and adding animation. Students also study methods and techniques for giving presentations using this exciting software. This course familiarizes students with the desktop publishing software program Microsoft Publisher. In this course students study creating publications with topics including working with text, working with graphics and objects, enhancing publications, working with multiple page publications, and many others. Students learn the basic operations and use of this versatile software program. This course will help students understand the mechanics of a relational database and how it can find, organize, and present data. Students learn to create a simple database and maintain that data. Forms, reports, and queries will also be explored, enabling students to create a more complex database system and manipulate data quickly and efficiently. Students work with and design objects such as multiple table queries, forms with sub-forms, and reports with sub-reports. Students in this course study the responsibilities for managing a business. Topics studied in this course may include making a business plan, cost planning and budgeting, development of the business and the business accounts, and the basics of buying and selling a business. This course introduces students to the foundations of business management, and how to apply those foundations to open a new business or to improve upon an already existing business. In this course, students study the nuances of promotion, advertising, and consumer spending, and how those concepts can be applied to getting the word out about a company, product or service. Students learn about planning effective advertising campaigns by analyzing public demand for a particular product or service, and the products offered by the competition. Students also learn about the different methods of marketing, and how technology has impacted the way marketing is handled for both big and small companies. In this course, students study the nature of Human Relationships. This includes group and individual behaviors, improving productivity and quality through correct motivation, developing employees, correctly rewarding employees, and dealing with a variety of job related conflicts. Students learn about the human element related to the work environment and methods to achieve an effective fit between people and the organizational systems. In this course, students study the nuances of the legal environments including law, business strategy, and business ethics. Topics covered in this course include administrative law, international law, business crime, torts, contracts, and business related legal issues. Students also learn about antitrust law, intellectual property, agency law, employee regulations, business associations, and securities law that apply to small and big business alike. Students in this course work with advanced features of word processing and electronic spreadsheet software programs. Topics covered in the advanced features of word processing may include integrating with other programs, working with advanced graphics and diagrams, working with forms, and customizing the software program. Work in the advanced features of the electronic spreadsheet program software program may include, but is not limited to, automating tasks, enhancing charts and graphics, working with pivot tables, and collaborating with other programs. This class prepares students for the higher level Microsoft Office Examinations. Students learn the basic principles of manual accounting as well as computerized accounting at an entry level using QuickBooks Pro. Students acquire an understanding of how to track figures using business accounting methods, and how to create and maintain proper accounts. Students create journals and ledgers to keep track of their accounts. Using this program students gain the skills to create a new company profile and begin to maintain its accounts, creating such items as balance sheets, income statements, and cash flow statements. Students will work with the bookkeeping software to better gain an understanding of its capabilities and applications in the business world. This course serves as an introduction to the necessary skills needed to operate a computer and function in a general environment. Students learn basic terminology associated with general computer operation and navigation. Topics covered in this course may include basic text editing, internet use and navigation, proper file management, and general computer navigation. Students enhance their typing skills through various assignments and topics throughout the course. Other topics may include job search techniques and job etiquette, and on-the-job behavior with regard to computer operations. Students in this course explore written and oral communication as a skill to be mastered and applied. Instruction covers communication strategies and conventions of written expression including idea generation, paragraph development, and essay construction. The writing portion of this course concentrates on the development of clear and organized sentences, paragraphs, and compositions, and their applications to real world documents such as cover letters, resumes, and memos. Students examine grammar, vocabulary and the writing process, and may apply the skills learned to multiple forms of writing. Students also explore oral communication skills used in a business setting, and how to effectively communicate written ideas. Other topics may include presentation skills, etiquette, interpersonal skills and delivery techniques. Students will be expected to deliver oral and written presentations to the instructor and classmates. Students in this course explore written and oral communication as a skill to be mastered and applied at a more sophisticated level. Instruction covers complex communication strategies and conventions of written expression focusing on concept development, report construction. The writing portion of this course concentrates on the development of clear and organized complex structures and their applications to real world documents. Students will be expected to deliver oral and written presentations to the instructor and classmates. This math course is a thorough review and study of algebraic concepts, functions, and operations, utilizing a balanced approach of basic algebraic theories with practical applications and conceptual understanding. Students review mathematical concepts including addition, subtraction, multiplication, fractions and decimals as it applies to business operations. Students gain an understanding of basic mathematical and algebraic concepts and functions needed for the world of business including but not limited to account balancing, payroll, depreciation, profit and loss calculations, interest calculations, problem solving, probability theory, and decision making. This course focuses on professional communication in the 21st workplace. Students in this course will hone their communication skills by working on various assignments and projects, including: face-to-face conversations, collaborative work groups, presentations, and interviews. Lectures include topics in nonverbal communication, cultural differences, organizational fit, and networking within specific industries through face-to-face interactions and via social networking sites, such as Facebook and LinkedIn. By the end of the course, students will have prepared industry specific portfolios and taken part in mock interviews specific to their field of study. Laurus College has a huge place in my heart. They really care about their students. They want their students to succeed.